There will be joy in Mudville as Xander Bogaerts will be at the bat. Sources have it that he will get the call, finally the phone has rung, to join the Red Sox on Monday, 19 August 2013 for their six-game road trip through California. Mark your calendar, you are witnessing history Red Sox fans. Since 1968 there has not been a Red Sox call up 20 years old or younger as a position player. Since 1968 there has not been the excitement we are seeing around a player like we are with this young talented player. So what are the Red Sox getting? 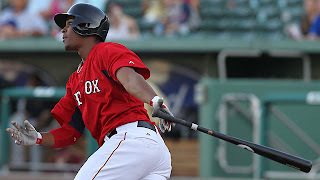 In 60 games with Triple-A Pawtucket, Xander Bogaerts hit for .284 with a .369 OBP, .453 slugging percentage and nine homers. He's spent most of his time at shortstop, but he's also played 9 games at third base. With the Red Sox struggling against lefties, he provides a solution. He has been hitting .298 with a .452 OBP, .474 slugging mark, 16 walks and just seven strikeouts in 73 plate appearances against southpaws. Wave the Dutch flag for Xander! Did I mention he is Dutch? An entire nation of baseball fans will be euphorically following Xander Bogaerts, energized by the nations World Baseball Classic performance and even more so by the potential appearance of a new national hero on the main stage of Major League Baseball. Here are a few tips if you want to shout out a few Dutch encouragements to Xander Bogaerts. What could be his role at this point in time with the Red Sox? He can platoon with shortstop Stephen Drew, who has started 25 straight games and who would benefit from both a day off (in his last six games, he's now 3-for-24 with a .125 average, .154 OBP and .208 slugging mark). In this platoon he would give the Sox a better chance in games started by left-handers. If he struggles on the main stage, it will only be briefly, as he has demonstrated with his fast track through the minors that he has the ability to adapt to higher levels of competition with exceptional speed. With the upcoming road trip to include several lefty starters with the Dodgers, the Sox have elected to make the move now, adding him to the team on the cross-country flight on Monday morning. He will get to taste the experience fully on the six-game California swing, hopefully getting a crack at the Giants righties that are lined up to face the Red Sox (Tim Lincecum, Ryan Vogelsong, Chad Gaudin). This is an event we have waited for in breathless anticipation for much of the summer. It is time for the unveiling, time to put him under the spotlight of the last three dozen games of the pennant race push. Xander Bogaerts has done everything in his power to be given the chance to find out.